A healthy, balanced diet provides the foundation for good micronutrition. However, it can be impractical to obtain a proper dose of all these nutrients. Our diets are often far from balanced. Most people don't even obtain even the minimal amounts of micronutients needed to adequately support health, let alone the amounts needed to function at an optimal level. 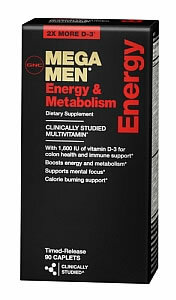 GNC Mega Men� Energy & Metabolism: Order Now! Top Selling Vitamin at GNC! 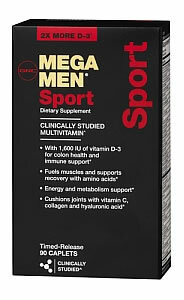 GNC Mega Men� Sport: Order Now! 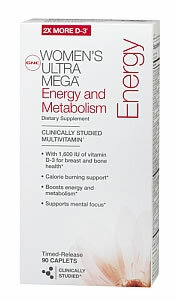 GNC Women's Ultra Mega� Energy and Metabolism: Buy Now! The "essential" vitamins and minerals, as defined by government agencies and nutrition experts, are those that are needed for metabolic function, but are not manufactured by our bodies. We must obtain these ingredients from outside sources, and thus they are an "essential" part of our diets. Multiple Vitamins often contain Vitamins A, C, D, E, K, Thiamin, Riboflavin, Niacin, Vitamin B6, Folic Acid, Vitamin B12, Biotin, Panthothenic Acid, Calcium, Iron, Phosphorus, Iodine, Magnesium, Zinc, Selenium, Copper, Manganese, Chromium and Potassium. Premium formulations contain larger percentages of these, as well as additional nutrients. Micronutrients contribute to the body's natural defenses on three levels by supporting physical barriers (skin/mucosa), cellular immunity and antibody production. Vitamins A, C, E and the mineral zinc assist in enhancing the skin barrier function. The vitamins A, B6, B12, C, D, E and folic acid and the minerals iron, zinc, copper and selenium work in synergy to support the protective activities of the immune cells. Finally, all these micronutrients, with the exception of vitamin C and iron, are essential for the production of antibodies. Overall, inadequate intake and status of these vitamins and minerals may lead to a suppressed immune system, which increases the risk of infections and aggravates malnutrition. Therefore, supplementation with a multivitamin/mineral that includes these micronutrients can support the body's natural defense system by enhancing all three levels of immunity.